France is ideally suited for equestrian vacations. Horseback riding tours got their start in France soon after the war and have become very popular there though they remain almost unknown in America. Standards are very high for French riding tour guides who must take lengthy courses and pass difficult exams to be licensed. Many trails have been kept open for horse riding in the French countryside and it is fascinating to ride through places which are so rich in history. Castles, walled towns, fortresses and monasteries are everywhere. Of course the food and wine are world famous and guests will eat and drink with particular relish after a day in the saddle. Each region has unique characteristics with its own history, cuisine, wine, architecture and topography. Southern France also has a far better climate than Northern Europe where the chances of fine weather are not nearly as good. Accommodations for riders vary between comfortably remodeled castles and picturesque country inns. 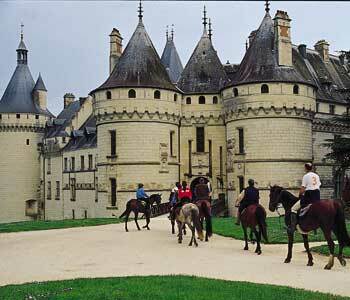 More detailed information about horseback riding in France is available here. We have summarized below some of the rides which are currently available. All these equestrian experiences have been thoroughly tested over the years and many riders have enjoyed them. Castles, Cliffs and Caves - This riding trip traverses a fascinating part of France around the Lot Valley where there are many traces of prehistoric man. One also sees much French history from the period of the Middle Ages. Fortresses and Forests of Dordogne - This riding vacation in the Dordogne visits some amazingly picturesque castles perched dramatically on impregnable heights. In a country where cuisine is next to God, this region stands out for its culinary excellence. Riding through the Vineyards of Cahors - There is much history to be seen on this ride, but there is an emphasis on wine for which the region is famous. One is often riding beside vineyards and there are many chances to visit wineries and taste the product. Unguided Riding - This unguided ride in the foothills of the Pyrenees is a wonderful adventure. The horses are most reliable, the local country people friendly, the food excellent and the organization impeccable. It is wonderful value for the money and we highly recommend it. The whole route is rich in history with many castles and villages which have changed little in centuries. This is the perfect horseback riding tour for experienced riders who are adventurous and resourceful. A New York Times article about it is available on request. Riding through Quercy - A comparatively slow paced horseback ride in a region of oak forests and truffles which is rich in history. It is near here that many of the magnificent prehistoric cave drawings were found. The famous old monastery of Roc Amadour hanging from the side of a cliff is on the riding tour along with other historical gems. Domaine des Garennes - The riding center is surrounded by oak forests with many roads and trails ideal for riding. It also has excellent food, warm hospitality, tennis courts and a swimming pool. Fascinating historical places are nearby. It is a fine destination for less experienced riders who want to see something of France and have other possible activities. As you can see, the opportunities for horseback riding in France are many and diverse.